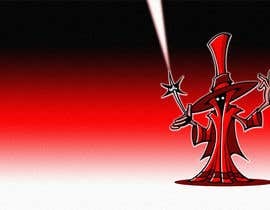 For 2D cartoon style game I need main antagonist model: an Evil Wizard. I'd prefer him to be in hood with darkness instead of face and glowing eyes, but it is for you to decide - convince me that your vision is better. Possible and acceptable character ideas are in first three attachments. Fourth attachment shows prototype of the game with temporary character. 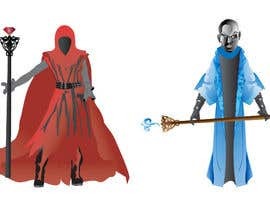 Note that I need 4 color variations of this model, that can be done with Hue modification + minor changes alike glyphs on the robe and different staff heading. 0. 2D, toon style, with fake proportions (mostly to fit in a square), etc. It should be well detailed, but should not evoke sympathy. 1. 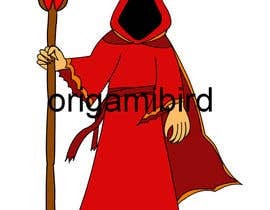 Wizard needs a staff, it is a must. - Gathering energy. Looped. Standing with raised staff, reading the spell text, going to cast. Minor 'energy' particles flying above staff heading or from surrounding air directly to staff header (consuming energy). - Cast. Not looped. Could be just hitting a ground with a staff (do remember, it was raised in previous steps?). 4. For intro movies, misc graphics, etc. 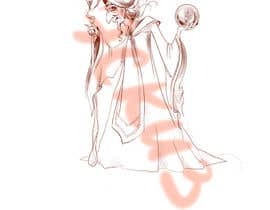 I need few (2-4) high-resolution Wizard illustrations (1024x1024). They could be made of concepts or some kind of temporary material, showing the characters in various poses (casting, walking, fighting, working, etc.). I.e. first attachment (red mage with raised hands) fits perfectly. You can use Flash, Illustrator, or 3D modeling with toon shader, or even scanned and cleaned hand-paintings. I actually don't care. I submitted your contest! I hope that you will like my drawing! I'm sorry that the quality is so bad I will post a picture with a better quality if you want! Done! I hope that you will like the wizard! #2 A rough sketch, need feedback.. if you like it I'll continue. To win the contest and get the job you don't need to paint everything, just a character model (1 frame from idle animation) and few concepts. After that I'll award you and wait for rest of the work. So you want all of this for that price? You want something with quality? Ok, I am on the way, Its is a very interesting job, I will do it, But still I want to say with all due respect....the price is very low, Can you please do some thing with that? Thanks.